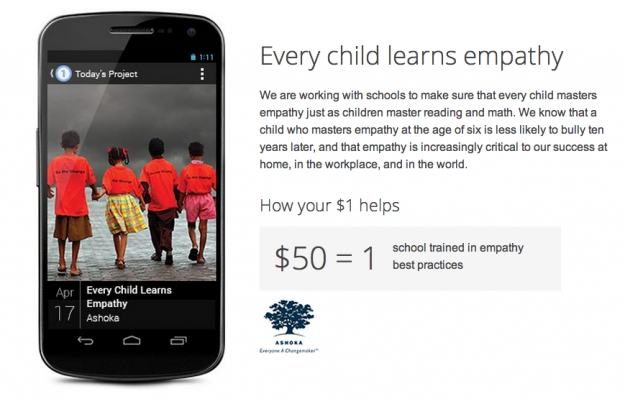 Google launches One Today app to help non-profits | Android Blast! Google has launched an app called One Today to make it simple for people to donate money to non-profits. In typical Google style, the company attempts to go for volume and change people's lives. By making an app that makes it simple for people to donate $1 to a non-profit, Google knows there is strength in numbers. This app will no doubt result in millions of dollars being donated to charity. The idea is that a user can donate $1 per project per day, but the app will allow users to donate more. One Today is a fantastic idea, and kudos to Google for creating it! The app is live in the Google Play store, but you cannot start donating money until you get an invite from Google. You can get an invite at the link below. Although One Today is only available on Android devices in the US right now, I'm sure Google will expand that in the future.